The Argyll jacket is the kilt jacket most favoured for day wear. It is also often called the Argyle jacket don't be confused or mislead into thinking these are different jackets, they are not, only the spelling is different. The biggest advantage that the Argyll has over other kilt jackets, such as the Prince Charlie, for example, is its versatility. While the Prince Charlie is suitable only for evening and formal wear, the Argyll on the other hand can be worn for formal, semi-formal and for day wear. 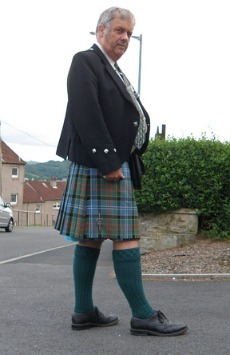 So it can be reasonably argued that the Argyll is the most versatile kilt jacket that you can own. 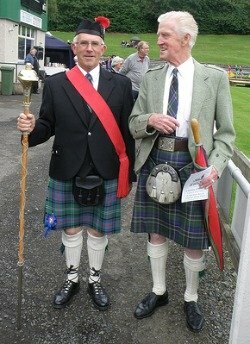 Compared to other kilt jackets, what makes this one so versatile? Well depending on whether you choose to wear it with or without a waistcoat (vest), will determine how formal or casual a look you achieve. You can see an example of the jacket in the photo below. The above photo was not only taken by Alex Cunningham, but the Gentleman in the photo is Alex Cunningham. And some subtle changes to your kilt accessories will allow you to wear this particular kilt jacket to any occasion you care to attend. I would like to say from a personal point of view, that elegant as this jacket is, in a formal setting it cannot equally compare to the elegance of the Prince Charlie kilt jacket. That said these Argyll jackets are made from top quality Barathea 100% pure new wool, and as such they are extremely comfortable stylish and hard wearing. They are available in a wide choice of colours, and this again adds to their versatility. Such a jacket in black for example when teamed up with a matching waistcoat, can be worn to most formal occasions, whereas lighter colours tend to be worn for day wear. Below you can see the jacket, in black, being worn without the waistcoat (vest) as day wear. One point to be aware of is that these jackets are sold without the waistcoat, so if you want to team it up with a waistcoat you have to buy it additionally. The jacket has a single button, which should not be tied, regardless of whether or not a waistcoat is being worn. The matching waistcoat has five buttons. The last photo shows the jacket in both black wool and tweed. Another advantage of the Argyll jacket is that you can choose to have the cuffs with different finishes. The first one is a gauntlet cuff referred to as an "Argyll", the next one is called a "Braemar", it is a three buttoned patch cuff which is also commonly found on the Prince Charlie jacket. The third cuff available is plain with a single button, and is known as a "Crail" cuff, the buttons on the cuffs are normally shiny silver (nickel plate) and match the button of the jacket. With so much choice available, I would advise you to discuss your options with your kilt maker before deciding which jacket is most suitable for your needs. 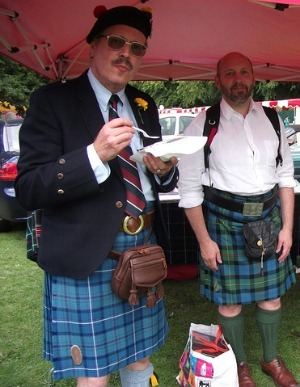 And of course if you have any questions about these kilt jackets, or anything else to do with this website, then please drop me a line using the "Contact Us" page, I would love to hear from you.